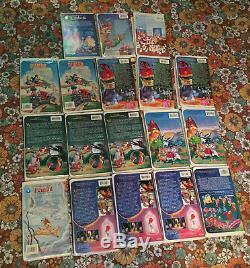 Listing is for a lot of 18 Disney Black Diamond Classic VHS tapes. 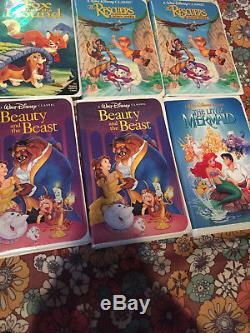 Lot includes 3 copies of the coveted Beauty and the Beast, 3 Aladdin, 3 Fox and the Hound, 2 Rescuers Down Under, 2 Dumbo, and a single copy of Cinderella, The Little Mermaid (with the original banned cover art), Bambi, Robin Hood, and 101 Dalmatians. 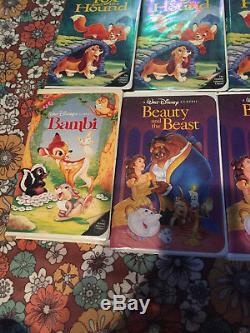 Tapes are overall in good condition, but there are a few imperfections on each one except Bambi. A complete description of the condition of each tape is listed below. Please feel free to message me with any questions. Beauty and the Beast 1. S mall crack on the top of case 2. S mall crack on the inside bottom left corner and 2 marks on the top edge along the crease 3. 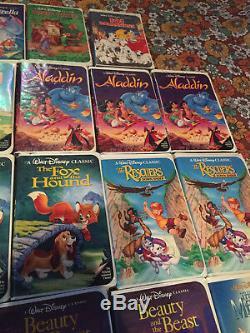 S mall crack on the top of case The Fox and the Hound 1. V ery tiny crack on the top front right corner 2. There are a patch of dents on the upper corner, a small crack on the inside right, and a small crack on the inside lower left 3. T iny crack on the top middle front Aladdin 1. S mall crack on the front top right corner 2. T here are cracks on inside top right corner, the inside bottom left corner, the inside bottom right corner, and the inside bottom middle binding 3. T here is some writing on the front top in black marker and part of the back plastic has peeled off Rescuers Down Under 1. T here is a dent on the bottom right corner, a couple tiny cracks on the top and bottom of center binding, and some light fading to the outside center binding 2. 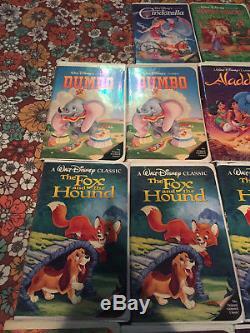 T here is a small crack on the front top right corner, and the top and bottom of center binding Dumbo 1. T here are cracks on the top and bottom of center binding, and cracks on the upper portion of the inside right molding that holds the tape in 2. T here is a crack on the upper right front corner and a small crack on the top of the center binding Cinderella 1. There is a crack down the center seam inside of case Bambi 1. The case looks great and nothing is popping out as a glaring issue Robin Hood 1. There are a couple cracks here and there and the right side of case is kind of crunched down 101 Dalmatians 1. There is a small crack on the top and bottom of the crease The Little Mermaid 1. There is a small crack on the inside top crease. 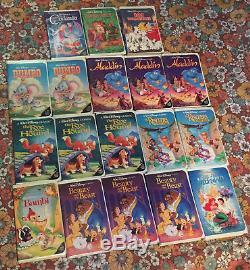 The item "Lot of 18 Rare Disney Black Diamond VHS Tapes Beauty and the Beast Aladdin" is in sale since Thursday, October 5, 2017. 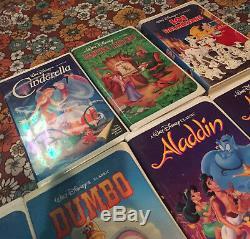 This item is in the category "DVDs & Movies\Wholesale Lots\VHS Tapes". The seller is "xknifex" and is located in Worcester, Massachusetts. This item can be shipped worldwide.